While there is no way I'm not going to replay Final Fantasy VI on mobile—it's one of my favorite games of all time, and I want it on my phone—these sprites are seriously bumming me out. They feel flat and boring and lifeless, like the artists were told to transform everyone into goofy, watered-down cartoon caricatures. Seems like Square Enix is using the same graphical revision that they used for the mobile port of Final Fantasy V. It doesn't work. It looks like a weird emulator filter or a collection of generic sprites from RPG Maker, which is not exactly how newcomers should experience one of the greatest games ever made. I'm not looking forward to seeing what the sprite animations look like now. 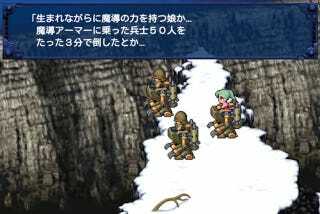 Final Fantasy V Comes to iOS Tomorrow, and It Looks... Like This. How do Super Nintendo sprites from 1994 look so much more layered and interesting and detailed than iOS sprites from 2013? We need an intervention, Square Enix. This is getting out of hand.